In a trench deep in the ocean floor lies the bound titan Kadum. He bleeds endlessly from the hole in his chest where his heart was plucked out. This blood -- the blood of the Mountainshaker, the blood of the Father of Monsters -- changes everything that it touches, men and beasts alike. 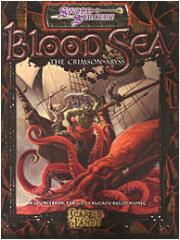 This sourcebook contains information for campaigns set in and around the Blood Sea, from creation of the sea to the beasts that owe their existence to it. Explore everywhere from the surface of the red waves themselves to the Heartsblood Archipelago and to the deepest sanguine depths of the crimson expanse.